Since our humble beginning, when two business partners, Jay Flenner and Larry Whittman, bought an old fire truck and started the Twin Bays Fire Department, then becoming the VFW Fire Department, in 1970 forming The Gravois Volunteer Fire Department and in 1992 The Gravois Fire Protection District was established. Our goal is to provide the best service possible to the citizens of the area we serve and meet our Mission and Purpose of protecting lives and property from destructive fires, prevention of destructive fires, performing emergency rescue and assisting in times of other emergency or disaster. We currently operate seven firehouses and one training and maintenance facility and provide service to 150 square miles, including 63 miles of shoreline. Our first firehouse was in Gravois Mills in the basement of the Supermarket and later moved to a new facility which is still in service as G-1. Other areas recognized the need for fire protection; community members got together and with the approval of the board of directors of the Fire Department, formed building committees to begin construction on new firehouses. Buck Creek Station was opened on O Road next to Saddle Road and designated as G-7 Firehouse, G-2 Firehouse was opened on P Road, Laurie Station was located in the basement of the Laurie Mall until the new G-5 Firehouse and the Fire Meeting Hall was completed on Firehouse Road in Laurie. Later G-3 Firehouse was opened off 135-3 on Wilson Bend Road and G-4 Firehouse located near Mallard Bay in Procter Area, with the last firehouse being built on 5-25-S and designated as G-6. We later purchased the old Fagen Lumber Building next to G-5 in Laurie and it became our Training and Maintenance Facility. In the beginning, The Gravois Volunteer Fire Department was an all volunteer department and funded totally by donations. 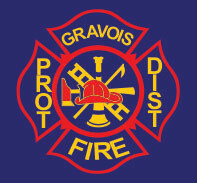 In 1992 voters approved the formation of the Gravois Fire Protection District which is funded by property taxes, and operated under the direction of a three member board of directors elected by the public we serve. The District is now a combination department made up of volunteer firefighters and officers, volunteer support staff, career firefighters, and a paid Administrative Assistant, Fire Chief and a Deputy Chief. Following the approval by the voters in 2007 of a 7 million dollar capital improvement bond and an increase in our general operating levy of 16 cents for paid firefighters we are able to continue to meet our mission and purpose. We now have nine paid firefighters on duty in three member shifts so that there is an on duty crew available 24 hours a day 365 days a year. The paid staff will not replace the volunteers as we require the joint effort of all personnel to meet our mission goal. The paid firefighters improve response time as they respond out of a station with apparatus along with the volunteers responding from their residence and picking up apparatus from the nearest stations. The paid firefighters also assume some of the daily duties that previously were the sole responsibility of the volunteer firefighters. The proceeds from the bond purchased 16 new fire apparatus, built two new firehouses to replace the old G-7 and G-5 Firehouse, funded a major renovation at G-3 and G-1 Firehouse and improvements to other firehouses. Currently, we operate a fleet consisting of nine pumpers; one quick response pumper; 2 brush trucks; 11 tankers; 2 rescue trucks; 2 service companies; 2 ladder trucks; 3 boats; a communications bus and various support and staff vehicles. Our annual emergency responses were less than 100 in our early years to over 800 a year currently. We respond to all fire calls, including natural cover fires, vehicle and boat crashes, entrapment’s, search and rescue calls, water rescue, other rescue calls, Hazardous Material incidents, Medical Emergencies, and respond to any type of disaster or large emergency. In addition to responding to emergencies, we also respond to service calls for odor investigations, carbon monoxide alarms, lift assists to persons, assistance to law enforcement and other public safety organizations, traffic control, fire safety and prevention educations, courtesy safety inspections and other non-emergency requests for service. The District’s ISO (Insurance Service Office) Rating, which insurance companies use to set the rates for home owners insurance, was a 10 in the beginning, later lowered to a 9, and in 2007 dropped to a 7. Efforts are under way to again lower the rating. Our training section has State Certified Fire Service Instructors and many of our firefighters are certified by the Division of Fire Safety as Firefighter I and/or II. Much of our training is done in-house along with regional training offered by the University Fire and Rescue Training Institute. We are a member of the Lake Area Emergency Services Association which has a training academy which regularly sponsors specialized training. Firefighters make up an Emergency Medical Services team of EMS First Responders and EMT’s. Members respond to medical emergencies along with the ambulance to calls within our District. Our agency has suffered, like all tax supported entities, from the recent economic down turn and it has had an effect on long term planning, but an only minimal effect on daily operations. We remain ready to meet the needs of the people we serve. With the support and dedication of all our firefighters and staff, the guidance from our elected Board of Directors and the continued support of our residents and tax payers we will be able to continue to meet the needs of the people we serve today and into the future. Our service area covers 150 square miles on the West side of The Lake of the Ozarks in Central Missouri, in Morgan and Camden County, the City of Laurie and City of Gravois Mills. Our Eastern and Western Boundaries are the center line of the Lake of the Ozarks and encompass 63 miles of shoreline. The area is primarily rural, with limited agricultural with the economy driven primarily by the recreational attraction to the Lake. Our year round population is 9100; this is a mix of working persons, families and retirees. The balance of home owners are weekenders or seasonal. From March to November our population can rise above 30,000 with peak weekend population exceeding 100,000. Operations include but are not limited to fire suppression, vehicle rescue, technical rope rescue, water rescue, outdoor search and rescue, Haz-Mat response through membership in a regional Haz-mat team, EMS, fire investigation, fire safety and public education. There are state certified fire service instructors and investigators on staff, the majority of our firefighters are certified Firefighter I & II by the State of Missouri. We have contractual mutual aid agreements with all Area Fire Departments and participate in the Missouri Statewide Fire Mutual Aid System and are registered with the Missouri Division of Fire Safety, report regularly to the National Fire Incident Reporting System, and are currently National Incident Management System compliant. The District currently operates a training and maintenance facility, seven fire houses, nine pumpers, two ladder trucks, one quick response pumper, two light water units, eleven tankers, two heavy rescues, two service companies, two fire boats, one rescue boat, a communications/support bus and various staff/support vehicles.